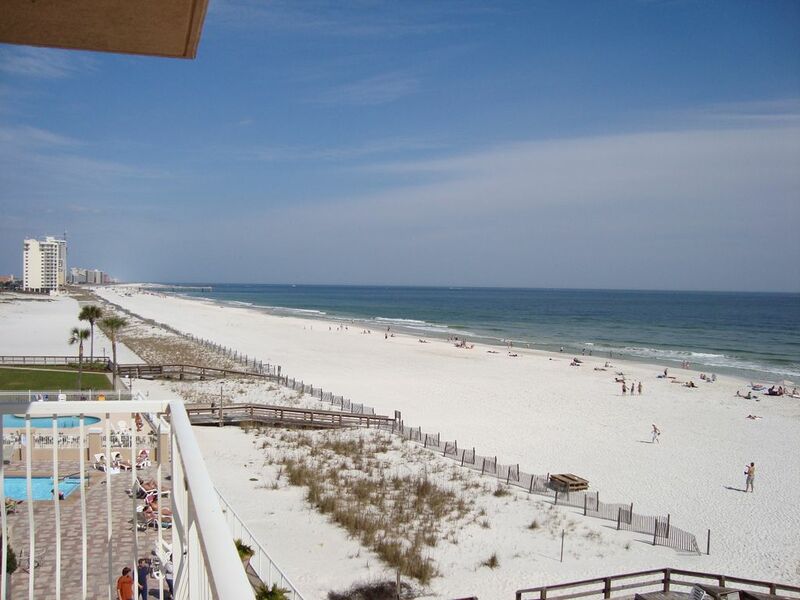 This immaculate, three-bedroom, two-bath, condominium rests directly on the Gulf of Mexico in the heart of Orange Beach, Alabama. Emerald Key Unit 401 is a most desirable, East End, 4th floor, corner unit with the best views on the beach. Please be sure to check our always up-to-date availability calendar for your dates of interest. If only a weekly rate is shown for your dates of interest, we are only accepting weekly rentals during that time period. Note: If the dates you want are booked, please check out my Listing # 37457 for another nearly identical, fantastic unit in this complex. Walk across the street to shopping, or lay out on the beach or by the cozy private beachside pool. With only 18 units, this upscale, low-density complex is the perfect place to relax. The complex has a large elevator and utility carts to transport your belongings to and from the unit. Stay in one of the nicest, best-kept units in the complex! If you choose to stay in touch with the rest of the world while on vacation, FREE Local Calling and FREE Unlimited secure wired and wireless DSL service is provided. When you arrive, you will be welcomed by the cool tile floors leading into the large, living area covered in stylish, Berber carpet. Bedroom One contains a queen-sized bed, night-stand, 22' LED HDTV, DVD, and am/fm clock radio/alarm. A sliding glass door leads to a private balcony. With two closets in this room, there is always plenty of closet space. Bedroom Two contains a bunk bed that has a twin on top and full on bottom. There is also a night stand, dresser, 22' LED HDTV with DVD, and am/fm clock radio/alarm. The large closet provides plenty of space. The Master Bedroom, with walk-in closet, contains a king-size bed, night stand, chest, dresser, 32' Samsung LCD Flatscreen HDTV with DVD, telephone, and a am/fm clock radio/alarm. The master bath features a garden tub of cultured marble and his and hers sinks. The master bedroom overlooks the Gulf. The kitchen is fully equipped with a refrigerator freezer with icemaker and filtered water, dishwasher, microwave oven, oven/stove, toaster, blender, coffeemaker, mixer, and a raised bar with three swivel bar stools. A dining area with raised table and chairs is adjacent to the kitchen. All kitchen utensils and dishware are supplied. The large living area contains a 40-inch Samsung LCD Flatsceen HDTV with Blue Ray Disc and DVD, as well as, a 220W sound system with a 5-Disc CD player, dual cassette tapes, and am/fm radio. High-Def Cable TV and local telephone services are provided. The huge, sliding, glass doors provide endless views of the beach. The pictures of this immaculate area speak for themselves. The large laundry room contains a washer and dryer, as well as, additional storage area. A full-size iron and ironing board are also provided. I am happily married, and have two children. I love to play golf and go deep-sea fishing in my spare time. We were the first licensed owner-rental managers in Emerald Key, and have enjoyed helping other owners become managers of their properties. We have been renting via VRBO for years and feel we offer the best value on the market. We maintain the unit in perfect order - always paying attention to all of the little details. Inquiries are always answered promptly and accurately. We chose to purchase this unit due to its perfect location on the beach, fantastic floor plan, the very low-density complex (18 units), awesome construction, and its close proximity to our home and our other rental unit. Our unit is only a couple of minutes from our favorite restaurants and amusement parks. I could stare at the ocean and sand from the comfort of this unit all day long. It's nice to pack a few clothes for a weekend trip without having to load the whole house as everything we need is always there for us. Direct beach front. Unobstructed view of the beach and ocean. Wireless Internet at no cost. (2) Large east corner wrap-around balcony faces the gulf for endless panoramic views. Private balcony from bedroom 2 has gulf views. Numerous boat rentals and charters available nearby. Ask owner for suggestions. Numerous golf courses nearby. Ask owner for suggestions. Beachside pool has bench seating and waterfalls. The Emerald Key Condominium Complex offers, LOW DENSITY, 18 condos - 3 per floor, gated parking lot with remote control entrance, oversized elevator & plenty of luggage carts, the pool (fully enclosed and gated) is perfect for children with bench seating all around the interior and soothing waterfall for the sunbathers, separate boardwalk to the beautiful gulf beach with shower area and bench seating, beach chairs & umbrella rentals on site, 2 shopping centers directly across the beach road with everything you'll need including walk-in Doctors offices for emergencies. The place was very nice, great location and right on the beach. The building pool wasn’t very nice but the condo itself was really big and well equipped. Clean, perfect size, great location! 3rd year at Emerald Key did not disappoint.great spot on the beach , close to everything, full amenities, perfect weather too! Jack was very easy to work within. Condo was well equipped, very roomy and clean; entry instructions were clear and concise. Property is smaller, 12 story building with 4 units per floor. Has an outdoor pool. If you’re looking for nice, clean, quiet for your family, I highly recommend this property. If only Jack could control the weather! Great unit. Very comfortable and plenty of room. Location is awesome. Having a smaller number of units in the building was nice and quiet. Very roomy and nicely decorates. Rates are subject to change until reservation is confirmed. We accept personal checks (if booked 30 days in advance), eChecks, cashier's checks, or credit cards via HomeAway/VRBO Payments or paypal. NOTE: There will be a 2.5% transaction fee to be withheld from the deposit refund.